Last week, I alluded to an upcoming project on the blog, and it's time to reveal it to you. On the recent Sunlit Pages survey, one of you suggested including some video on the blog. While I wouldn't necessarily call a single suggestion a universal clamoring, it did plant the idea in my head. I considered: if I were to add some video to the blog, how would I do it? What would I talk about? What platform would I use? The idea of sitting by myself chatting to a screen kind of terrified me, but then one of my friends suggested doing a Blab, and I was like, "What's a Blab?" The simplest answer is that Blab is like Periscope but for several people. But if you're like me and haven't joined the Periscope craze yet, then that explanation probably didn't help you. Basically, Blab is a live video streaming service where two to four people interact through video and potentially many more people watch and participate through comments on the sidebar. Rather than a couple of people videoing their conversation in isolation and then publishing it for everyone to see, it all happens live, right in front of you. The idea that I wouldn't be doing this alone was instantly appealing, and I knew almost immediately who I wanted for my partner in crime: Suzanne. 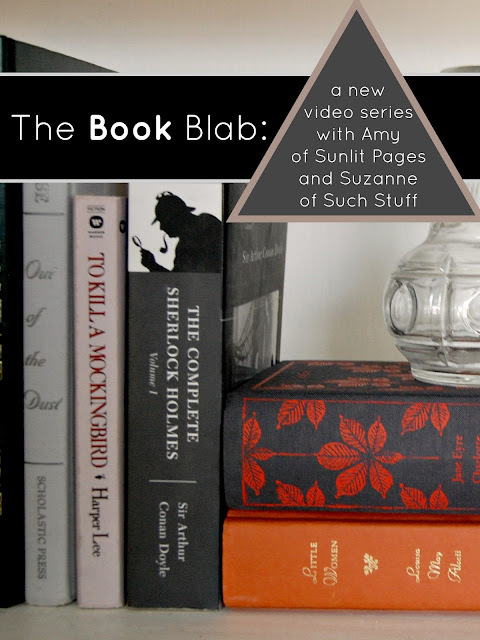 You might remember Suzanne from my post about nine blogs I visit for book recommendations. Her blog, Such Stuff, has been one of my favorites for a long time, and I knew that if there was someone I'd feel comfortable just chatting over the screen to, it would be her. I proposed the idea, she liked it, and we began to work out the details. You can watch the video live from this site (or Suzanne's site) at the scheduled time. So just pop over here at 7:00 MST, and the video will be going. You won't have to do a thing. As my kids would say, easy-peasy-lemon-squeezy, right? Alternatively, you can watch it directly from the blab site by following this link (from your desktop or your phone). If you want to participate, you can sign in using your twitter account (don't worry, you won't be on video--you'll just be able to type in comments and questions). If you can't make it on November 19th at 7:00 MST, we will be recording the blab and will post the replay of it the following day, so you can watch it at your convenience. This first episode will mainly be an introduction to the series as well as a chance to learn a little bit more about Suzanne and myself, but we have some fun topics coming up in the future, so we hope you'll join us for these monthly video chats. Questions? If this confuses any of you, feel free to ask me more about it. I don't promise to know the answer since this is the first time in my life I've been on the social media forefront. Also, if there's anything you've been dying to know about Suzanne or me, feel free to ask and we'll try to answer it on Thursday. See you then! P.S. Check out Suzanne's announcement, too. She does a better job of explaining this whole Blab thing. Fun! Too bad I'll be smack in the middle of a 4-hour rehearsal next Thursday at 7. Yay for a replay! This. Is. Great! Thanks for continuing to inspire me Amy!!! Oh wonderful!! Can't think of questions at present but I'm sure I will. Not sure if your timezone will line up but can I watch them after?